Clearasil is easily the world’s oldest and best-known brand of acne care products. It was created in the early 1950’s by American entrepreneur Ivan Combe with the collaboration of chemist Kedzie Teller. Combe advertised his product on the long-running American television program American Bandstand, touting his product’s superior smell to other acne treatments of the time that were based on sulfur, brewer’s yeast, and garlic. Clearasil pads are good for treating acne on oily skin. In 1961, the brand was bought by the makers of Vicks Vapo-Rub, which sold the product line to Procter & Gamble in 1985. A few years later the brand was bought by the cosmetics giant Boots Group, which in turn was acquired by the Reckitt Benckiser Group. Despite frequent changes in ownership, little about the product has changed over the last 50 years. Clearasil products are inexpensive and easy to find. Clearasil pads offer the right ingredients in the right amounts and at the right pH for treating acne on oily skin. Clearasil is good for back acne. Clearasil products usually are not the best option for sensitive skin. Clearasil products are inexpensive, and they are easy to find. They contain 10% benzoyl peroxide, more than most other over-the-counter brands, and the company offers a good beta-hydroxy exfoliant pad for people who have oily skin and acne. Products that provide beta-hydroxy acids in the right concentration and at the right pH are hard to find. The downside of Clearasil products is that they are made to smell good with fragrances that can irritate the skin. However, if you don’t have sensitive skin, sometimes Clearasil is the most cost-effective treatment option for on-the-spot acne care. Most Clearasil products are based on benzoyl peroxide. Some people find this anti-acne chemical to be too irritating for use on the face. Benzoyl peroxide is superior to all other common over-the-counter acne care ingredients, however, for the treatment of back acne. Clearasil Acne Fighting Cleansing Wipes are a great option for exfoliating oily skin, especially if removing makeup is a problem. They contain salicylic acid (the only commonly used beta-hydroxy acid) in a 2% concentration, strong enough to work on oily skin, at a pH of 2.9, acidic enough to dissolve makeup and soap film. They are great for battling blemishes, but be careful when using them around the eyes. Clearasil’s StayClear Daily Face Wash is good for extremely oily skin. It is too foamy for use on dry skin, and people who have Asian skin types should avoid it. Clearasil’s StayClear Daily Face Wash for Sensitive Skin is good for most skin types—except sensitive skin. This product contains ingredients that can dry out the skin, although it is free of ingredients that can cause skin allergies. Clearasil’s StayClear Oil-Free Gel Wash contains salicylic acid, a beta-hydroxy acid that can loosen dead skin and debris and relieve inflammation. If you only have the product on your face for a few seconds, however, it won’t remove much dead skin and debris. It may reduce inflammation and make red pimples more noticeable. Don’t use this product around the eyes, since it may sting and burn. Don’t use it if you have rosacea. Clearasil’s StayClear Skin Perfecting Wash is really a skin scrub. It contains microscopic particles of polyethylene plastic that bind to skin oils and have an abrasive effect on the skin. You can’t rub your pimples away, however, and you should not use this product on patches of skin where pimples have broken out. It will only irritate and inflame the skin around pimples, opening tiny cuts and cracks where even more infectious bacteria can get inside. If you have nearly perfect skin, however, this product is a good option for keeping it that way. 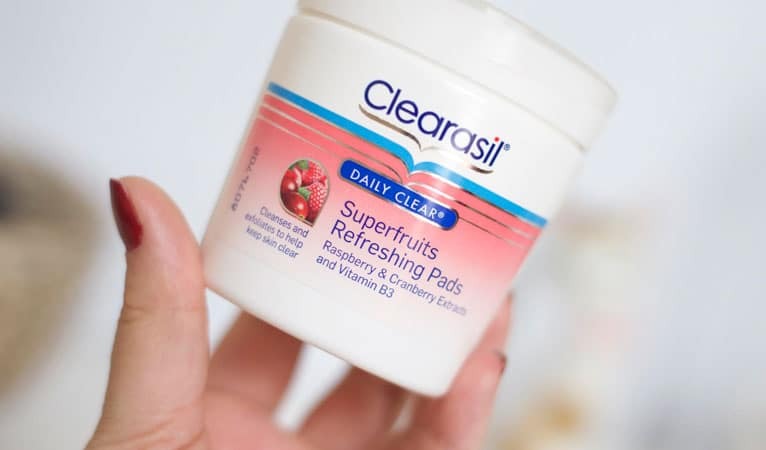 Clearasil’s StayClear Daily Pore Cleansing Pads work best on oily skin, and they actually work better if you use them only every other day. Most users will find the menthol in the pads to be “tingly.” Some users will find the menthol in the pads to be irritating. Trial and error will tell you whether you will experience inflammation as a result of using the pads, but if you have oily skin, and you don’t have skin allergies, they are a good choice at a low price. Clearasil’s StayClear Daily Facial Scrub is a facial scrub that is actually labeled as a facial scrub. It contains tiny particles of polyethylene plastic that can lift dirt and grime off the skin. As with the StayClear Perfecting Skin Wash, however, this product should not be used directly over pimples, only around them. The salicylic acid in the scrub may make the skin around pimples less noticeably red. Clearasil’s StayClear Adult Acne Care Treatment Cream contains germ-fighting sulfur and resorcinol in higher-than-average concentrations. There is no doubt that this product definitely will kill acne bacteria. The problem is that it contains so much sulfur and resorcinol that many people should not use it. How can you tell if StayClear Adult Acne Treatment Cream is not for you? If you rinse the product off your face, and your face still feels tingly, then the product is too strong for your skin. Clearasil’s StayClear Tinted Acne Cream Treatment and StayClear Vanishing Acne Cream Treatment both provide 10% benzoyl peroxide, enough benzoyl peroxide to kill acne infections fast. The Tinted Cream product has a peach-colored tint that masks the redness of a pimple, although sometimes “peach face” can be more noticeable than the pimple it is used to treat. The StayClear Vanishing Acne Cream Treatment is the same product minus the peach-colored tint, making it easier to use with makeup. Both products are good for treating pimples that have not responded to other products. Clearasil’s Ultra Daily Face Wash, Ultra Gel Wash, Ultra Deep Pore Cleansing Pads, Ultra Acne Clearing Scrub, Ultra Rapid Action Treatment Cream, and Ultra Acne Solution System are all a little too “ultra” for their own good. These products contain alcohol that dries out the skin, menthol that irritates the skin, or salicylic acid at a pH too high for it to work. The Ultra Acne Solution Kit only contains one useful product, the Quick Start Treatment Cream with 10% benzoyl peroxide. If you are starting with 10% benzoyl peroxide, however, you may discover that your skin is sensitive to the product. The Ultra Acne Solution System seems like a good buy, but there’s a real risk of drying out your skin unless you happen to have especially oily skin. (In general, all Clearasil products are best for very oily skin.) If you don’t have oily skin, you will probably be better starting off with a different skin treatment system like Exposed Skin Care. It costs more, but it’s a lot less likely to damage your skin.